A young man buttons his tux as he walks with other young black men for 500 Black Tuxedos Event, on Saturday December 12th, 2015 in Milwaukee, Wisconsin. The Milwaukee Art Museum serves as the perfect back drop for a group photo on Saturday December 12th, 2015 in Milwaukee, Wisconsin. Andre Lee Ellis, the organizer of the 500 Black Tuxedos Event, leads the participants from the bus drop off point on Cathedral Square to the dinner location at the Chic Cafe on Jefferson Street Saturday December 12th, 2015 in Milwaukee, Wisconsin. Dan Simmons, managing editor of Milwaukee Magazine and photographer Sara Stathas talk about their photo essay on the 500 Black Tuxedos event. 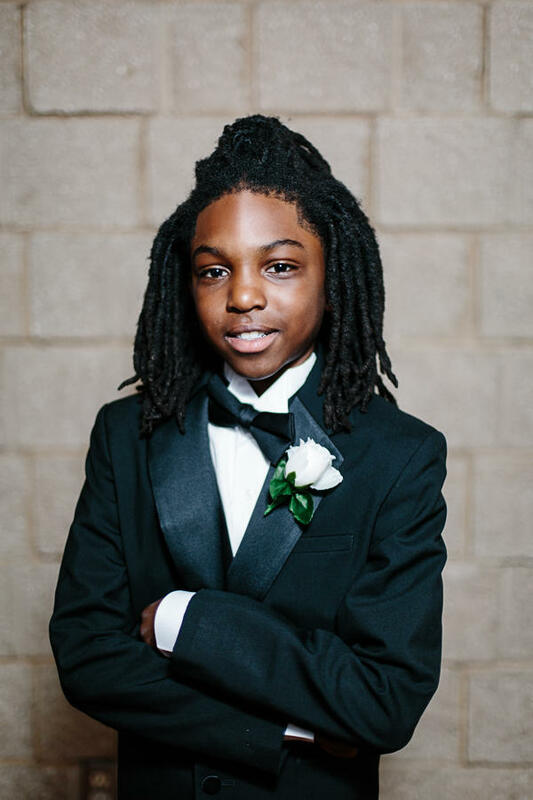 Jimmie Evans, 11, wears his tuxedo proudly at the 500 Black Tuxedos Event, organized by Andre Lee Ellis on Saturday December 12th, 2015 in Milwaukee, Wisconsin. One was about an annual event, now called 500 Black Tuxedos. The latest gathering took place last December and saw hundreds of African American men and boys dress up for a day and evening on the town. The event was also the subject of the Well Suited photo essay featured in this month’s Milwaukee magazine. Writer Dan Simmons and photographer Sara Stathas were on hand at the event to capture every moment. Simmons described the event as "people in their best dressed, on their best behavior, displaying their best selves." "Its hard not to be moved," he says. "They all looked so amazing," adds Stathas. "It was inspiring for me as a photographer to take the time to pull some of them aside and do some one-on-one portraits of them and really capture that." Ellis plans to continue the 500 Black Tuxedos tradition each year and is sharing his insight with other cities wanting to carry out the same type of event. While we wait for the event, Well Suited will serve as evidence of a beautiful night on the town. 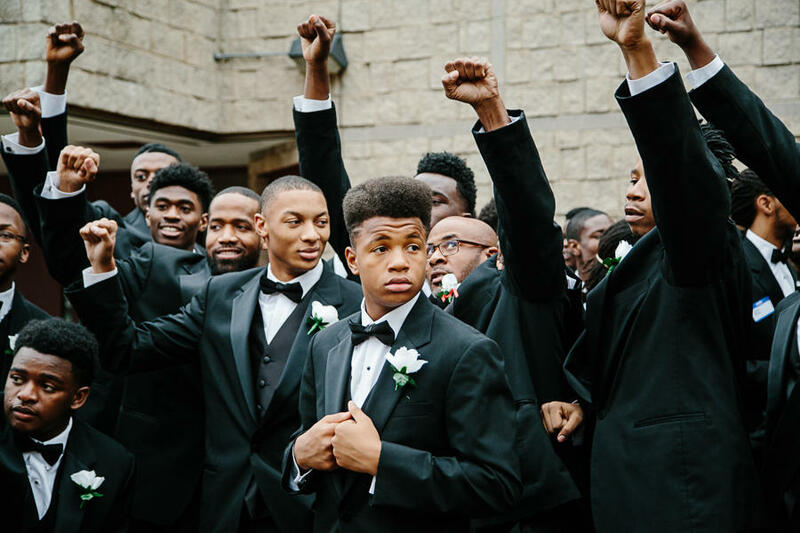 A young man fixes his tuxedo as others raise a fist to the air signifying their unity. This moment of "We got this!" says everything about the events meaning to photographer Sara Stathas. Ex Fabula shares Andre Ellis’ story, his vision of healing and of community. A grassroots movement is underway in Milwaukee’s 53206 zip code to improve the lives of young African American men who live there. This summer, we reported on the program called We Got This. It was the brainchild of Andre Ellis. He started giving a few boys $20 to clean the neighborhood on Saturday mornings. Since then, the numbers have swelled; so have relationships. People living in Milwaukee’s 53206 zip code face tough problems, but on Saturdays, things are different. Thousands of the men from this zip code are in prison or have records. Jobs are scarce; poverty, almost universal. Some people sell drugs or their bodies to make money.